SoundCloud Saved By The Bell Of A Big Chunk Of Financing : The Record After a noisy month in the press and a significant round of layoffs, SoundCloud announced today it had secured its largest round of financing to date, ending speculation of its demise (for now). 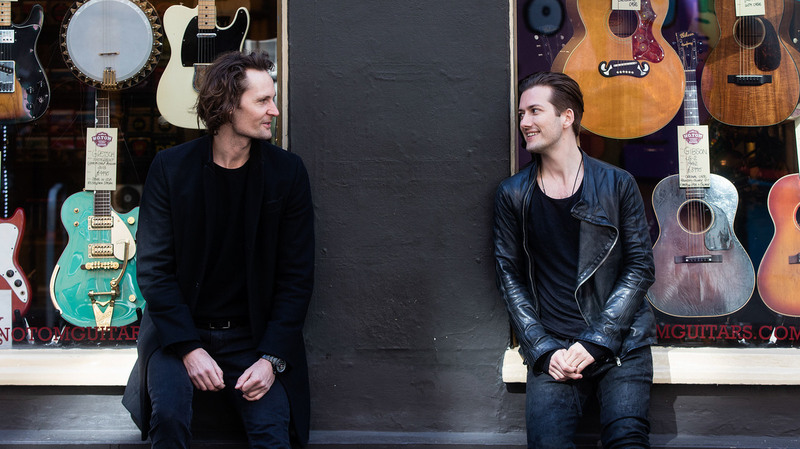 SoundCloud co-founders Eric Wahlforss, left, and Alex Ljung in 2016. The company closed a significant financing round on Aug. 11, 2017. SoundCloud and the uploads of its many rappers, producers, noise bands and nascent podcasts are safe, for now. The company announced the "largest financing round in the history of SoundCloud" in a blog post this morning; a source with direct knowledge who requested anonymity in discussing the private business transaction confirmed to NPR Music that the amount was around $170 million. Not including this most recent financing, the company has raised $298 million across eight funding rounds, according to CrunchBase. The funding comes from two firms, The Raine Group — which also holds stakes in Vice Media and C3 Presents, the owner of Lollapalooza — and Temesek Holdings, a state-run Singaporean holding company with interests in several state-run Chinese companies. In addition, co-founder Alex Ljung will be stepping down as CEO, but remaining chairman. Ljung will be replaced by Kerry Trainor (who also takes a seat on the board), former CEO of Vimeo. Mike Weissman will be taking over the still-vacant COO position, from the same position at Vimeo. Co-founder Eric Wahlforss will remain as chief product officer, a role he transitioned to from chief technology officer in January. "There's an insane amount of noise about SoundCloud in the world right now. And it's just that, noise," wrote SoundCloud co-founder and CEO Alex Ljung in a post published July 14, eight days after announcing he was laying off around 40 percent of his company's staff as a cost-cutting measure. That news rightly prompted some concern for the company's well-being. Many wondered what would happen to the wide variety of music uploaded to the platform (for my part, I've spent the morning listening to the brilliant catalog of Call and Response Records in Tokyo), prompting attempts to archive that material. As well, many wondered what would happen to global music culture after a potential loss of the unique ecosystem cultivated by SoundCloud's free-for-all-style strategy. The vast catalog of creator-uploaded work has long differentiated SoundCloud from other digital music companies like Spotify or Apple Music, which require artists to use a digital distributor to be listenable. That same differentiation, though, caused the company its fair share of problems. As SoundCloud grew in popularity, major labels and publishing companies began noticing, for example, the many DJ mixes taking advantage of their intellectual property. The major labels began their negotiations with the company aggressively, pulling music down as they worked out deals that ended with all three of the majors (Universal, Warner and Sony) holding equity in the company. This also resulted in SoundCloud launching a paid streaming service, called SoundCloud Go, which has failed to gain much traction. "We're all just getting started," Ljung writes. Whether or not that's true, they at least have not reached their conclusion.